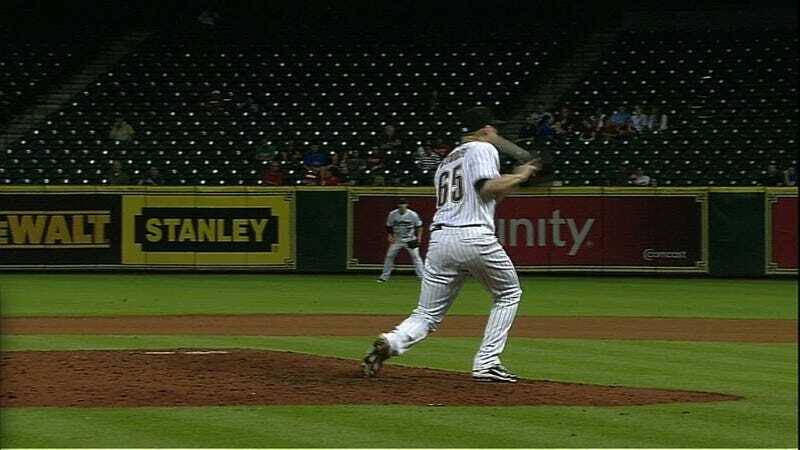 A bad season for Houston got even worse tonight as rookie Astros pitcher Mickey Storey was knocked out of tonight's game on a play eerily similar to the one that left A's pitcher Brandon McCarthy with a fractured skull last week. In the top of the eighth inning with the Astros down 3-0, Cubs outfielder Dave Sappelt drove a comebacker to the mound that Storey either attempted to field or deflect. Deflect it he did—right into his own face. Storey remained on the field for several minutes as trainers checked his jaw, then exited the game. We'll update this post when we hear more about his condition.